m 45 x 23 x 28 (total size). 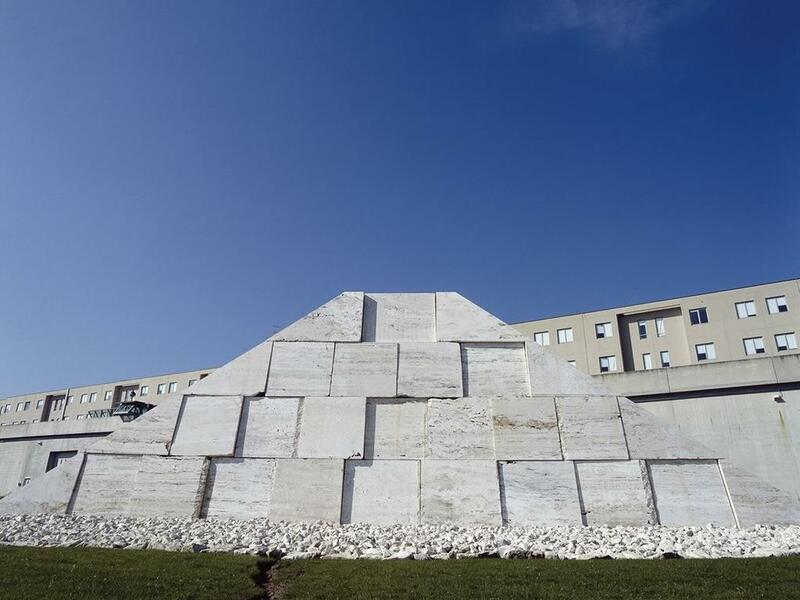 The project plans for this work won the National Contest for the Social-Industrial Building Trade in the Region of Lazio. 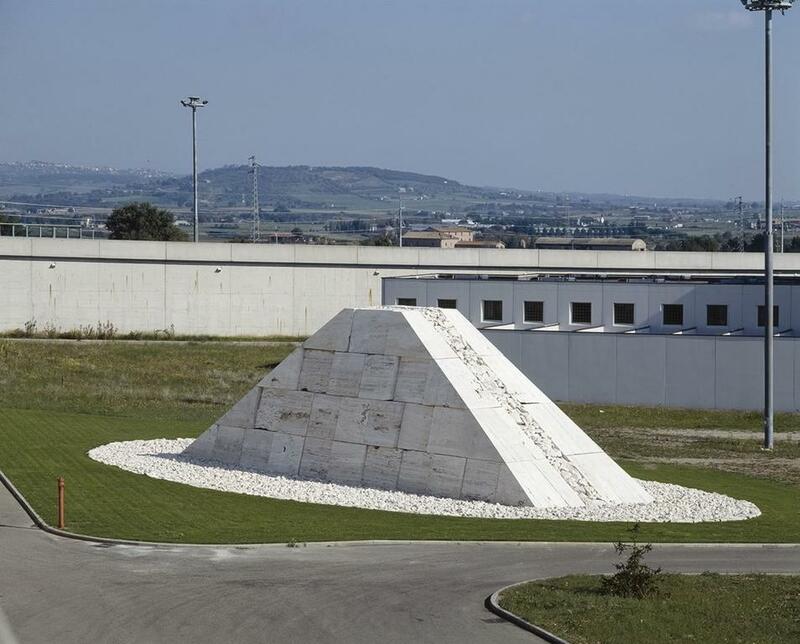 The pyramid-shaped structure was then built by the Nuova Casa Circondariale (low security prison) in Viterbo whose characteristics gave origin to its meaning and structure. 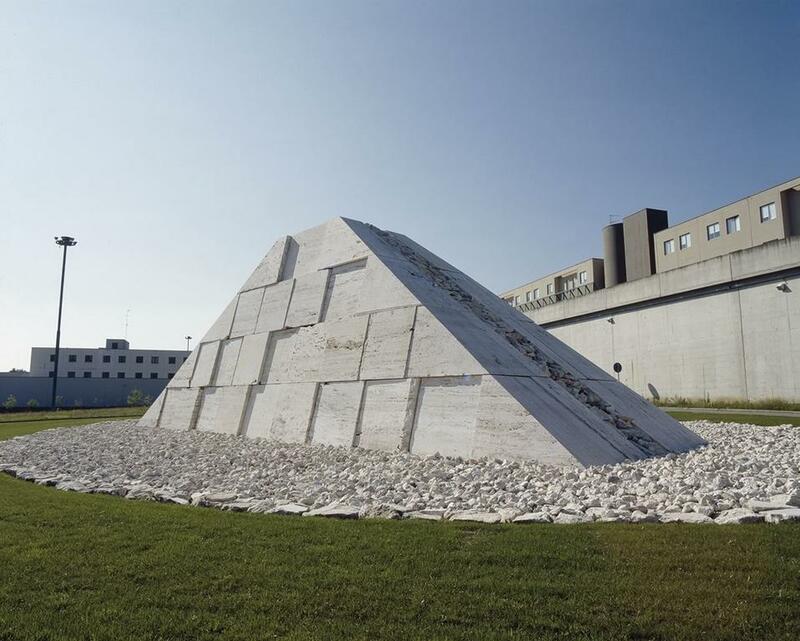 Inside the walls of the prison, on a trapezoidal area of grass, four rows of blocks of various dimensions were dry-mounted to form a frustum ideally placed on an elliptic base of crushed travertine stone. The large solid is divided longitudinally by a groove and filled with gravel. It seems to slide at the bottom, enlarging itself in the base’s ellipse. The balance of this “insula,” which appears to be unstable, defines its message: people who are momentarily secluded and separated from the outside world experience the sensation of being lost. The blocks of stone become fragments of life at the mercy of events, displaced from geometry into chaos, a return to order or complete ruin left open in its fall. The grass, by contrast, enhances even more the white of the material like a sea and marks the confines of the stone island, powerful but precarious in its resemblance of a familiar landscape.